I have been a maker of colourful stuff since birth. 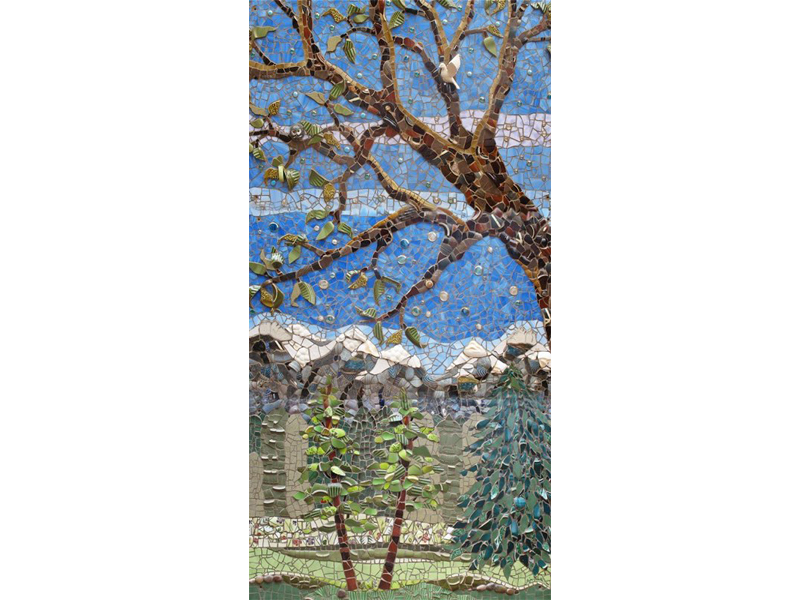 After a childhood in Germany, a background in design and working in acrylics, my love for mosaics was awakened and I have been hooked on this expressive medium for nearly twenty years. Working with pieces of other people’s lives in the form of broken china and pottery, which they leave on my studio’s doorstep, is very satisfying as I am giving these elements a second life and keeping loads of materials out of the landfill. I also incorporate forks, buttons, bottle caps and type writer keys, which makes me a borderline hoarder but also an environmentally engaged artist. I particularly enjoy creating artwork that evokes a special memory, be it my client’s family home, farm or cottage incorporating some of their family’s china, something people have a deep connection to. I love the interpretation of home, houses of any size and shape and appreciate the beauty of nature. 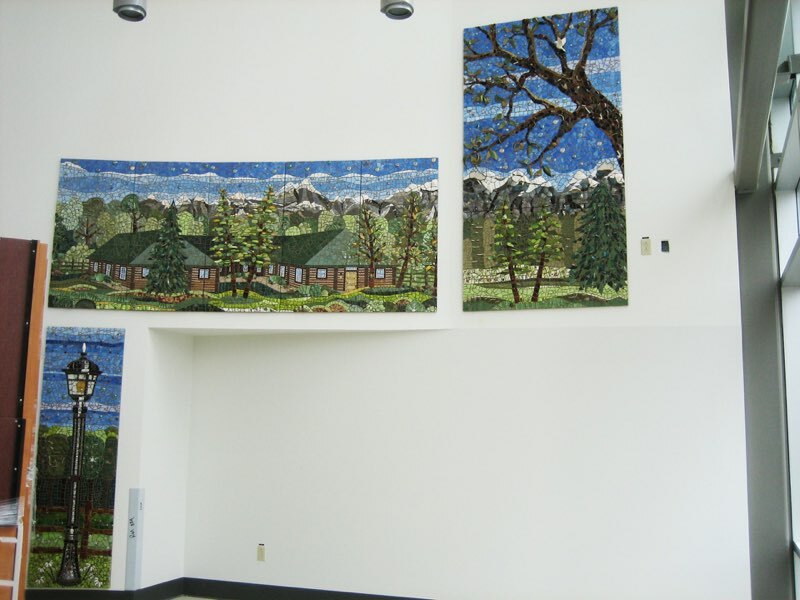 Mazankowski Alberta Heart Institute, Edmonton, Alberta “Serenity"
The Arts in Healthcare, Friends of University Hospital Organization commissioned Anja to create a large scale mosaic to hang in the Donor Appreciation Area in the new Heart Institute. 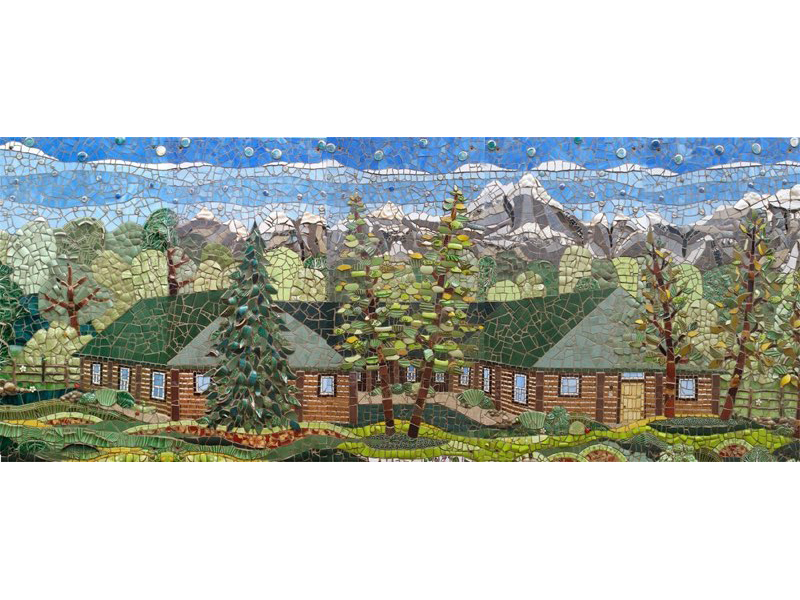 The design was created to incorporate the Donor’s love for the Jasper Park Lodges as well as provide an interesting visual for patients awaiting treatment. 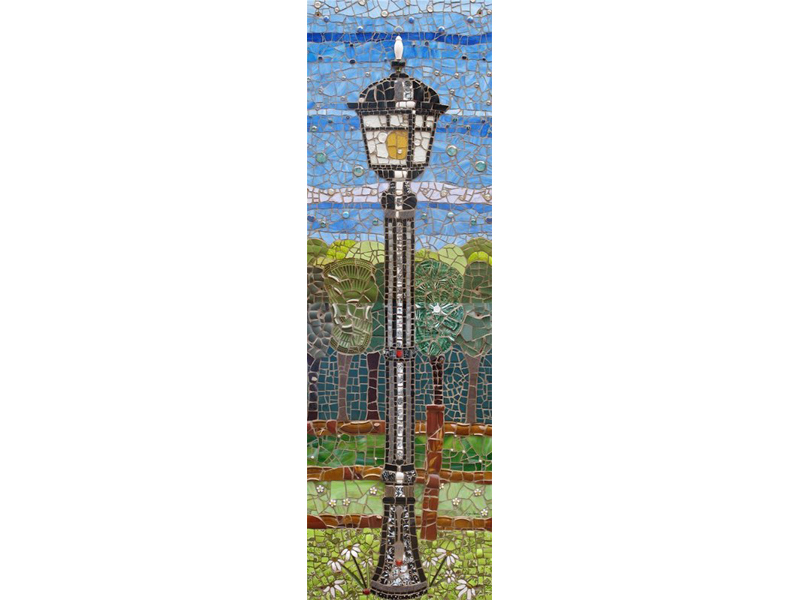 The mosaic is divided into three distinct pieces with each one divided further into smaller panels for ease of installation. Two panels are high up to be viewed well from a distance with the third piece at eye level, available for touching. Numerous materials were used including tile, ceramic dishes and collectibles ( notice the dove and owl on the tree), stained glass, beads and buttons. The large piece depicting the Lodges is 4’-0” tall by 10’-0” wide, the Tree is 7’-6” tall by 4’-0”wide and the Lamp Post is 6’-0” tall by 2’-0” wide. Please contact the artist to arrange a visit! your own unique design. Please bring your lunch, coffee/tea and treats will be provided. Note: All projects except for the stepping stone will need grouting, which will be scheduled at a mutually agreeable time for all participants during the following week. If you are not able to return for grouting, although it is highly recommended, I can do a demonstration and send you home with some grout. If none of these dates work for you and you have a group together , contact me and we will arrange another date! Or if you have a suitable location where a class can be held and a group of participants , I am willing to travel. Payment must be received to hold a spot. e-transfer or cheque accepted. Create your own 6”x6” mosaic art piece of your own design using pre-cut bits of china, pottery and tile plus beads, buttons and bottle caps! Grouting will be donw for you within 2 weeks. Note: This workshop will also be held at the Grafton Community Centre, 718 Station Street, Grafton. A workshop is a great gift of an experience. Contact me and I will email you a coupon for your loved one! I will come out to schools as a visiting artist and share my passion and knowledge by enabling the children, as young as kindergarden and up to Grade 12, to create their own whimsical 6”x6” mosaic art piece. Each session will start with a short age appropriate introduction to the history of mosaics, a gallery talk where I will share some of my recent works, followed by an explanation of the technique involved. All the materials, pre-cut tile and dishes as well as beads and bobbles, glue and of course the wood base will be provided. The theme of the artwork can be geared towards the curriculum such as bugs, flowers, landscapes, whatever your class may be studying at the time. This particular art form fits well into the study of the environment as most of the materials are reused or recycled. Students are encouraged to bring broken dishes, beads or bottle caps etc from home to incorporate into their artwork....just no glass please! For the older students I will set up a cutting station to give the tile nippers a try, complete with goggles for safety. I will then take all the art pieces back to my studio to grout, as grout is very dusty and corrosive and thus not suitable for classroom work. Unless the older students would like to give the grouting a try. The finished pieces will be returned in two weeks time. I particularly enjoy working on legacy projects which are permanently displayed in a school or other public building. They usually involve the entire school body or a certain grade, are specifically designed for their location and require lots of creativity and imagination. The cost is based on each project individually.